In a large pot add milk with thyme and garlic. Bring to a simmer ,then shut off the heat to let the milk steep. Let it steep for at least 30 minutes. Once steeped, strain the milk mixture and discard the thyme and garlic. 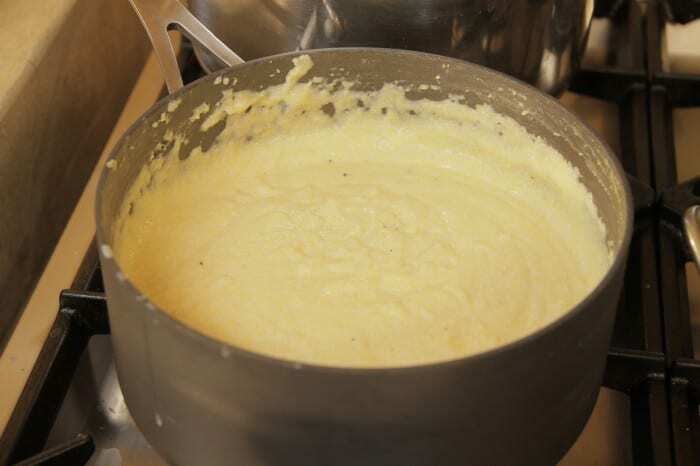 Bring the milk back up to a simmer and gradually pour in the cornmeal in a slow, steady stream, whisking constantly. Once the milk is completely absorbed, lower the heat and set a timer for 20 minutes. Continue cooking, whisking often, until the timer goes off, add chicken stock if the mixture is too thick (it should be like creamy mashed potatoes). Once the timer goes off, the polenta should be thick and smooth. Finish with butter, grated Parmigiano and salt and pepper.